Increased BMI may affect the determination of bone mineral density (BMD) by dual X-ray absorptiometry (DXA) and speed of sound (SOS) measured across bones. Preliminary data suggest that axial SOS is less affected by soft tissue. The purpose of this study is to evaluate the effect of body mass index (BMI) on BMD and SOS measured along bones. We compared axial BMD determined by DXA with SOS along the phalanx, radius and tibia in 22 overweight (BMI > 27 kg/m2), and 11 lean (BMI = 21 kg/m2) postmenopausal women. Serum bone specific alkaline phosphatase and urinary deoxypyridinoline excretion determined bone turnover. Mean femoral neck – but not lumbar spine BMD was higher in the overweight – as compared with the lean group (0.70 ± 0.82, -0.99 ± 0.52, P < 0.00001). Femoral neck BMD in the overweight – but not in the lean group highly correlated with BMI (R = 0.68. P < 0.0001). Mean SOS at all measurement sites was similar in both groups and did not correlate with BMI. Bone turnover was similar in the two study groups. The high BMI of postmenopausal women may result in spuriously high BMD. SOS measured along bones may be a more appropriate means for evaluating bones of overweight women. Shortly after the introduction [1, 2] of dual X-ray absorptiometry (DXA) for measuring bone mineral density (BMD) it became apparent that BMD positively correlates with body mass index (BMI) in post- , and to a lesser degree in premenopausal women [3, 4]. Voluntary weight loss results in bone loss in both young [5, 6] and elderly females [7, 8]. Prospective studies indicate that early postmenopausal women with lower BMI-lose more bone as compared with those with higher BMI tertiles [9, 10]. As thinness is related to both osteoporosis  and increased fracture risk , low BMI was included in the risk assessment tools for evaluation of osteoporosis [13, 14] and osteoporotic fracture risk . The high BMD of overweight was attributed to a permissive effect of weight on the skeleton , suppression of circulating, increased aromatization of adrenal androgens by the adipose tissue , and vitamin D deficiency causing secondary hyperparathyroidism . Accumulating data casts some doubt on the association of high BMI and BMD [18–20]. Evaluating cadaver bones indicates a significant contribution of soft tissue to the apparent BMD [21–23]. Wrapping lard around the body affects BMD to different extent by various densitometers and software versions [23, 24]. The precision of BMD measurement at the lumbar spine is affected by high BMI, presumably by abdominal fat [25, 26]. Finally, the decreased BMD of dieting women may be an artifact following an increase in bone area determined by DXA scanners [27, 28]. Several qualitative ultrasound (QUS) studies reported that soft tissue slows the speed of sound (SOS) transmitted across bones, both clinical- [29–31], and in vivo situations [32, 33]. On the contrary, SOS measured in vivo along bone is corrected for soft tissue thickness , and is only slightly affected by BMI . This study, therefore, evaluates the hypothesis that comparing BMD and SOS propagation along bones in overweight and lean women may determine the role of overweight in BMD measured by DXA. Subjects were recruited from women approaching the Endocrine Institute of the "Assaf Harofeh" Medical Center for measurement of BMD by DXA. Thirty-three consecutive postmenopausal women (median age 59 years, range 45–78) were included in the study. Participants were categorized to the Overweight group, n = 22; BMI ≥ 27 kg/m2, or the Lean group, n = 11; BMI ≤ 21 gm/m2. Candidates were excluded from the study if they had BMI > 21, <27, a metabolic bone disease such as hyper- or hypoparathyroidism, premature menopause (before the age of 40), Paget's disease, osteomalacia, osteogenesis imperfecta, or renal osteodystrophy. Women with debilitating diseases such as severe cardio-pulmonary, chronic liver, collagen vascular, or malignant diseases were also excluded from the study. Previous treatment with bone-affecting medications such as bisphosphonates, calcitonin, fluoride, anabolic steroids, glucocorticoids, anticonvulsants, thiazide, or higher-than-recommended doses of vitamin A and D precluded enrolment in the study. Medical history and life style characteristics were retrieved from dedicated case record forms. SOS measurements using Sunlight Omnisense™ (Sunlight Medical Ltd., Tel Aviv, Israel) were performed along the distal third of the radius of the non-dominant limb (RAD), proximal phalanx of the index finger (PLX), and the mid-shaft tibia (TIB), using an acoustic gel. Data were reported as SOS, and T- and Z-scores as compared to the device's female Caucasian Reference Database . SOS measurement by this device discriminates women with hip , vertebral  and forearm fractures from postmenopausal control. BMD of the lumbar spine (L2–L4) and femoral neck was obtained by DXA (Hologic QDR 4500 Elite®). The relevant T- and Z-scores were derived from the manufacturer's database. Blood samples were collected by venicpuncture for determination of serum bone specific alkaline phosphatase (BSAP) activity (ALKPHASE-B, Meta-Biosystems Inc, Mountain View, CA) with sensitivity of 0.7 U/L, intra- and inter assay CV of 5.2 and 5.8%, respectively. Normal reference values for females are 14.2–42.7 U/L. Deoxypyridinoline (DPD) excretion was determined in the first morning post-void specimen (Pyrilinks-D, Meta-Biosystems Inc, Mountain View, CA). Normal DPD reference values are: 3.0–7.4 nm/mm of creatinine. The sensitivity of the assay is 1.1 nm/mm, intra- and inter assay CV are 4.8 and 8.4%, respectively. Every participant signed an informed consent. The institutional and governmental ethical committees approved this study. Descriptive statistics, Mann-Whitney U test, and Spearman rank order correlation were employed when appropriate. The non-parametric tests were used for analysis because of small numbers that did not assume a Gausian distribution. A P value lower than 0.05 was considered statistically significant throughout the study. As pre-selected, the Overweight group had a higher mean BMI as compared with the Lean group (30.9 ± 2.7, 19.6 ± 1.2, respectively, P < 0.0001). Both groups were of comparable age and were beyond the early postmenopausal stage (Table 1). All patients seldom participated in physical activity and consumed moderate amounts of calcium daily. *Mean ± SD, **P < 0.0001, aBMI = Body mass index. Bone properties of the study groups (mean ± SD). 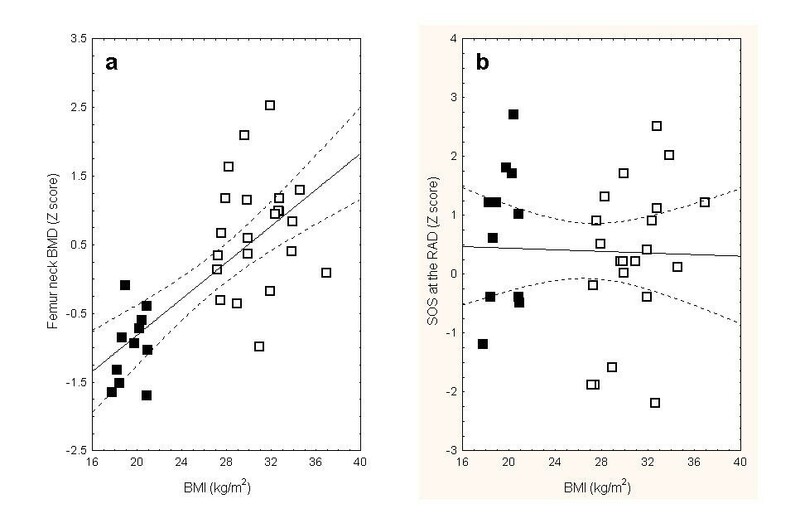 Spearman rank order correlation coefficient of body mass index (BMI) and bone mineral density (BMD) at the femoral neck (a) and speed of sound (SOS) at the radius (b). Lean patient marked as filled squares and overweight women in open squares. The correlation between BMI and femoral neck BMD is statistically significant (R = 0.68, P < 0.0001). Spearman rank order correlation between bone mineral density and speed of sound at various measurement sites. Urinary DPD excretion rates were similar in the Overweight and Lean groups of women (6.2 ± 3.4 and 5.1 ± 4.2, respectively, NS). Similarly, circulating BSAP was comparable in the study groups (28.8 ± 11.7 and 19.7 ± 8.8, respectively, NS). Neither DPD nor BSAP correlated with SOS or BMD in both groups of patients. This cross-sectional study reveals a high positive correlation between BMD at the femoral neck and BMI in postmenopausal women. In contrast, SOS propagated along bone is independent of BMI. SOS correlated with BMD in lean individuals, and to a lesser degree in overweight women. These findings suggest that the increased BMD commonly reported in overweight women may result from soft tissue interference with BMD determination by DXA. Our data of femoral neck BMD dependency on BMI is consistent with previous cross-sectional studies of postmenopausal women evaluating lumbar spine , femoral neck , combined lumbar spine and total femur [9, 10], and whole body BMD . High BMI decreases the precision of BMD measurements in the setting [25, 26]. In addition, In situ studies indicate a significant contribution of soft tissue to BMD accuracy measurement error [22, 23]. Moreover, changes in BMD in weight-losing premenopausal women were judged artifactual due to opposite fluctuations in bone mineral concentration and bone area . Therefore the association between higher BMD and BMI is as yet uncertain [18–21]. Several investigators suggested that decreasing lumbar spine [8, 41, 42], total body [7, 8] or femoral neck BMD  in dieting postmenopausal women indicate the role of soft tissue in interfering with bone densitometry by DXA. However, as weight loss is associated with increased bone turnover [7, 8] and secondary hyperparathyroidism that is preventable by calcium supplementation . We believe that this BMD decline results from genuine changes in the bone and not from a lower interfering effect of soft tissue. Our data of higher femoral neck BMD in the Overweight group, similar SOS in the two groups that is soft tissue independent, and is only slightly affected by BMI (34), and a correlation between SOS and BMD only in the Lean group suggest that the increased BMD in the Overweight group is spurious in accordance with the previous suggestion . In contrast to our data, two recent prospective studies [9, 10] of placebo arms of anti-resorption treatments indicated accelerated bone loss and higher bone turnover  in thin women. However, in contrast to our cohort of patients, these studies evaluated early postmenopausal women. At this early stage of changes following menopause, the impact of thinness on bone resorption may be higher. QUS is dependent on both BMD and bone micro architecture. This may explain the fact that some reported low correlation between QUS and BMD [45, 46] while others found high site matched correlations between QUS and BMD [47, 48]. Therefore, the meaning of varying Z-scores of BMD Z and SOS in the Lean group and to lesser degree in the Overweight group is uncertain. Our data of similar SOS in both the Overweight and Lean groups is in accordance with a previous study of excised bone  and a clinical , and is only slightly affected by BMI revealing a lack of correlation between BMI percentiles and SOS using the same QUS system. QUS systems that measure SOS across the bone are affected by the soft tissue size [29–31]. In contrast, Omnisense detects the first signal to arrive at the receiving transducer, according to Snell's Law, and the principle of Minimal Action. The time taken by the signal to travel between the transmitter and the receiver is the parameter measured by Omnisense The system's software uses a proprietary algorithm to analyze the various SOS variables and calculates the patient's bone SOS, and eliminating the effect of soft tissue surrounding the bone. The apparent limitations of this study are the small number of enrolled patients that may account in part to lack of correlation. Indeed in a study of 290 subjects significant negative correlation were found between SOS at the radius and tibia and BMI and % total body fat . Additional limitation of our study arethe use of a cross-sectional as compared to a prospective design, and the lack of data on total and regional body fat in relation to BMD and SOS. As the bone sites measured by DXA vs. SOS are completely different, one should be cautious in drawing any conclusions of their relationship to BMI. The higher SD of BMI in the overweight group means higher probability for positive correlations. It may not be appropriate to compare significances of correlations between BMI and bone parameters. BSAP was 50% higher in overweight vs. lean, but because of large inter-individual variation this difference did not reach significance. Therefore, the conclusion that the levels were similar may not be valid. The comparison of BMD and SOS in groups of overweight and lean post-menopausal women indicates that the high BMD associated with overweight results from soft tissue interference with DXA. MS participated in the study design and data collection. PG participated in study design and data analysis. MJR participated in study design and critical review of the manuscript. MW participated in study design and wrote the manuscript.